In Antarctica in January, 2013 – the summer at the South Pole – scientists released 20 balloons, each eight stories tall, into the air to help answer an enduring space weather question: when the giant radiation belts surrounding Earth lose material, where do the extra particles actually go? This NASA-funded mission is called BARREL, for Balloon Array for Radiation belt Relativistic Electron Losses. 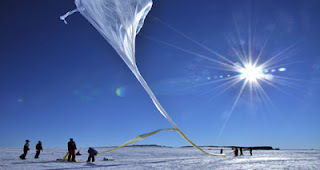 Each balloon launched by the BARREL team floated for anywhere from three to 40 days, measuring X-rays produced by fast-moving electrons high up in the atmosphere. BARREL works hand in hand with another NASA mission called the Van Allen Probes, which travels directly through the Van Allen radiation belts.